A s an upper extremity surgeon, Dr. Pirela-Cruz specializes in hand and microvascular surgery, nerve transfers and limb replantation. For some patients in Guatemala, this means having the opportunity to regain or improve hand function that would otherwise be lost. The physician still recalls one of the worst cases he has ever seen as surgeon. A 15-year-old boy’s forearms were permanently plastered to his upper arms after he was severely electrocuted and burned at the age of three. Due to the complexity of the deformity, the teenager was flown to El Paso, where Dr. Pirela-Cruz and other volunteer doctors from the community could successfully correct his hands, helping him gain better function and a more aesthetic appearance. In addition to bringing much-needed medical care to a developing country, the mission trip serves as a networking opportunity for students to meet prominent hand surgeons from throughout the U.S. For residents nearing the completion of their orthopaedic residencies at TTUHSC El Paso, that means they can apply for fellowships with the hand surgeons they met on the GHHF trip. The medical mission also helps them decide if they want to pursue a career in hand surgery. The GHHF began in 2004 as an outreach program for the American Association for Hand Surgery’s Vargas Award and has since grown into a holistic hand surgery and therapy program. It also conducts targeted community outreach projects, such as building latrines, stoves, school desks and benches. All this is conducted in the town of Chichoy Alto, a Mayan village in the highlands of Guatemala, where families live on $1 a day. 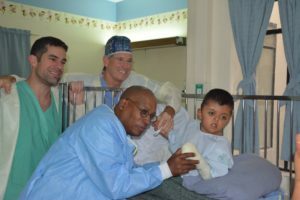 Since its establishment in 2004, the GHHF has evaluated 1,302 patients for hand surgery or therapy; conducted surgery on 510 patients; and fabricated 1,086 orthotics. The foundation also hosts educational lectures and workshops for local medical providers and physical and occupational therapists; these lectures span all aspects of orthopaedics, including how to make orthotics and care for nerve injuries. 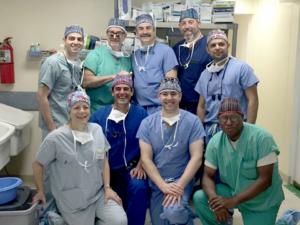 Physicians, nurses, surgical techs, anesthesiologists, hand therapists and non-medical volunteers from across the Unites States and Canada fly in to take part in the initiative.